The Vol-Con voltage continuity tester. 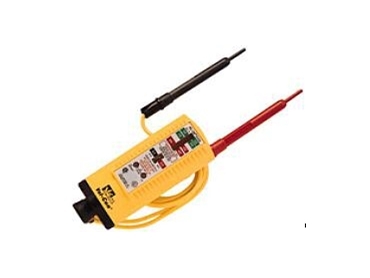 IDEAL Industries Vol-Con voltage continuity tester, available from CLC Tech , is suitable for rugged workplace use. This heavy-duty voltage tester is designed for testing voltages up to 600V ac or dc and as low as 5V ac or dc. The Vol-Con is a non-switching continuity tester automatically protected against damage from accidental contact with live voltage. It features built-in safety checks for operator safety as well as spring loaded safety shields on the test probes. The unit tests for continuity, identification of ac/dc, 24-60Hz frequency, dc polarity, blown fuses, grounding and current leakage. Replaceable test leads are available with or without fused probes.